Acne Medication Market size is set to exceed USD 7.0 billion by 2024; according to a new research study published by Global Market Insights, Inc.
Increase in number of people suffering from severe acne problems in the North America region especially in the Unites States will be one of the major market driving factors. According to the Global Burden of Disease study, the prevalence of acne vulgaris in the U.S. is around 80%-85% among the adults aged between 12-25 years of age. Hence, growing number of people suffering from acne problems will lead to enhanced business growth. Growing awareness regarding the acne treatment among the people living in the developing nation of Asia Pacific region will increase the sales of acne medication products. The people living in developing countries such as India, China, Taiwan and Thailand are now becoming more aware of the need to treat acne problems. Due to increase in awareness among the people regarding acne medication and its properties, there has been a high demand in the market for acne medication products, fueling the industry growth over the forecast period. The need of rigorous testing and follow-up for the use of prescribed isotretinoin will be one of the major market impeding factor. Stringent rules and regulations that are needed to follow while using the retinoids for acne medication will hamper the business growth in the forthcoming years. Oral acne medication market is estimated to witness a considerable amount of growth at a CAGR of 6.9% over the projection period. Increase in number of persistent and severe cases of acne will result in growing demand and adoption rate of oral acne medication products as topical acne medication is not as effective as oral for the treatment of several types of acne blemishes. Retinoids market held maximum market share in the year 2017 and was valued at around USD 1,299.9 million in the year 2017. Several advantages of using retinoids for acne treatment such as anti-aging, removal of dead skin cells, face cleansing and decreased post-inflammatory hyperpigmentation will be few of the major reasons for growing demand of acne medication products in the near future. Prescription acne medication products are estimated to grow at a robust CAGR of 6.3% over the projection period. Increase in number of people suffering from severe acne problems that are not cured by OTC acne products will augment the growth of prescription acne products. The sale of acne medication among the people of age group 17-25 years was around USD 1,372.7 million in the year 2017. Excess skin oil and bacteria, improper food habits, hormonal changes and smoking are the major reasons for growing acne problems in the people aged between 17 and 25, thereby escalating the demand and boosting the acne medication market growth in the forthcoming years. 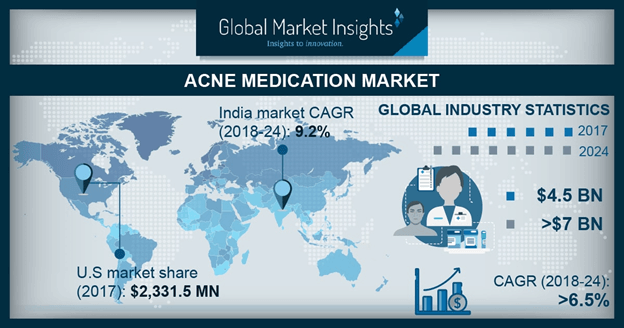 India acne medication market is projected to witness substantial growth at a CAGR of 9.2% over the forecast timeframe. According to a recent research survey, it was observed that the acne is one of the major skin problems in the school children. Along with increasing prevalence of acne in India, growing awareness among the people regarding the acne problems and the treatments associated with it will be one major market boosting factor. Brazil dominated the Latin America acne medication market and was valued over USD 110.9 million in the year 2017. Growing prevalence of severe acne problems in the country along with increase in concern of the people towards facial aesthetics has resulted in boosting the demand and adoption rate of acne medication products, enhancing the industry growth in the Latin America region. Prominent industry players include Allergan, Galderma, Valeant Pharmaceuticals, Bayer Healthcare, Johnson and Johnson and Teva Pharmaceuticals. The industry participants use strategies such as enhancing their manufacturing footprint, acquisition, new product launch and geographical expansion for improving their market position and competing with existing players to incur maximum sales and revenue.